Bruxism is an abnormal clenching or grinding of the teeth, either while awake or during sleep. Bruxism may play a role in temporomandibular disorders (TMD), although the exact link is unclear. A number of studies have shown a strong relationship between bruxism and TMD. Manfredini looked at 212 patients with a diagnosis of TMD and found bruxism in 87.5% of patients with myofascial pain with disc displacement and in 68.9% of patients with mysofascial pain without disc displacement. A literature review of 46 papers did not, however, show a causal link between the two. The relationship is complex and it may be that bruxism leads to symptoms of TMD or that the two co-exist. Bruxism can occur during sleep and when awake. Awake bruxism is thought to be related to psychosocial factors such as stress, anxiety, and depression. Habits such as nail biting, pencil chewing, jaw bracing and tongue or cheek biting are also considered to be forms of awake bruxism. Sleep bruxism was once thought to be related to these same psychosocial factors, however, current research does not support this. It is now thought that central factors are the most likely cause of sleep bruxism. Sleep bruxism, also known as parafunction or parasomnia, is thought to be related to micro-arousals during the sleep cycle. During our normal sleep cycle we have reactivations of our brain that allow us to become more aware of our surroundings without us actually waking. These reactivations are known as micro-arousals and allow our body to readjust temperature, heart rate and breathing rate and to wake us up if any threat is perceived. These arousals usually occur once or twice a minute and last only a few seconds. One study using EEG found that sleep bruxers had a significantly higher number of sleep arousals than non bruxers. These extra arousals were more common during non-REM sleep and most episodes of bruxism also occurred during non-REM sleep. The study also found that heart rate increased during a bruxism episode. It is thought that the increase in heart rate caused by an excessive number of micro-arousals causes increased neural activity, which in turn stimulates the motor neurons resulting in rhythmic contraction of the muscles of mastication and bruxism. Interestingly, it has been found that about 60% of non-bruxers also have rhythmic contraction of the muscles of mastication but without tooth contact. It is estimated that up to 20% of the population bruxes and of those up to 20% have symptoms of TMD. Most episodes of bruxism occur in supine and are more common in those with sleep apnea, sleep disorders and in sleep walkers. Bruxism becomes less common with age. Many patients are unaware that they clench or grind particularly if they have sleep bruxism. The following symptoms may be indicative of bruxism. • Sleep partner’s complaint of tooth grinding. • Waking with teeth clenched. • Waking with tenderness and restriction in the muscles of mastication. • Waking with tooth or gum sensitivity. • Indentations in the inside of the cheeks or the edges of the tongue. • Hypertrophy of the masseter muscles. • Excessive dental wear, including loosening or fracturing of the teeth. • TMJ clicking or locking, TMJ pain, headache. • Snoring can be an indicator of sleep bruxism. Managing bruxism that is related to symptoms of TMD usually requires a multi-factorial approach. Patient Education - If the patient’s bruxism is occurring during the day then education and advice is needed to help change habits such as nail biting, pencil chewing and jaw clenching. Helping patients to identify and address stressors in their daily life can be helpful. In some cases patients may benefit from relaxation therapy, breathing training and exercises. Referral to a psychologist may help some patients. Sleep Hygiene - Education about good sleep hygiene can also be helpful. Patients should be advised to avoid large meals, alcohol and caffeine within three hours of bedtime and to improve their sleep environment by ensuring low or no light, minimal noise, no pets or children in the bedroom when sleeping and to try to go to bed and get up at the same time each day. Sleep Studies - If a sleep disorder such as sleep apnea or other sleep disorders are suspected, the patient may benefit from a referral to a sleep clinic for studies. Breathing Difficulties - If the patient is suffering any respiratory disorders, including allergies they need to see their doctor for investigation and management. 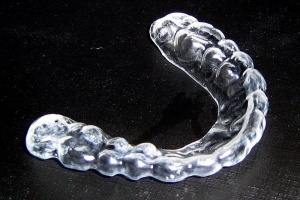 Occlusal Splints - There is evidence to support the use of occlusal splints at night for patients with sleep bruxism. The aim of these splints is to hold the teeth slightly apart even when a patient clenches or grinds. This reduces the compression of the temporomandibular joint (TMJ) and may also reduce long-term damage to the teeth. Research has also shown a reduction in masseter and temporalis activity levels and pain after using an occlusal splint at night. ↑ Fernandes G; Franco AL; Siquiera JT; Gonçalves DA; Camparis CM; Sleep bruxism increases the risk for painful temporomandibular disorder, depression and non-specific physical symptoms. J Oral Rehabil. Vol. 39, No 7, pg. 538-44, 2012. ↑ 2.0 2.1 Manfredini D; Cantini E; Romagnoli M; Bosco M; Prevalence of bruxism in patients with different research diagnostic criteria for temporomandibular disorders (RMC/TMD) Cranio, Vol. 21, No. 4, pg. 279-285, 2003. 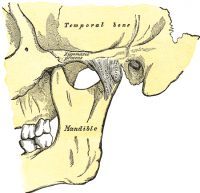 ↑ Trenouth MJ; The relationship between bruxism and temporomandibular joint dysfunction as shown by computer analysis of nocturnal tooth contact patterns, J Oral Rehabil, Vol. 6, No. 1, pg. 81-87, 1979. ↑ Manfredini D; Winocur E; Guarda-Nardini L; Lobbezoo F; Self-reported bruxism and temporomandibular disorders: findings from two specialised centres. J Oral Rehabil., Vol. 39, No. 5, pg. 319-25, 2012. ↑ Lobbezoo F; Ahlberg J; Manfredi D; Winocur E; Are bruxism and the bite causally related? J Oral Rehabil. Vol. 39, No 7, pg. 489-501, 2012. ↑ 6.0 6.1 Selvaratnam P; Friedmann S; Gershman J; Zuluaga M; Management of temporomandibular and cervical components of headaches; Headache, Orofacial Pain and Bruxism, Chapt 19, pg 239, Churchill Livingston Elsevier, 2009. ↑ Manfredi D; Lobbezoo F; Role of psychosocial factors in the etiology of bruxism. J Orofacial Pain, Vol. 23, No. 2, pg. 153-66, 2009. ↑ Okeson J; Bell’s orofacial pain. The management of orofacial pain. Quintessence Publishing Co. Inc. Chicago, 2005. ↑ 9.0 9.1 Kato T; Thie NM; Huynh N; Miyawaki S; Lavigne GJ; Topical review: sleep bruxism and the role of peripheral sensory influences. J Orofacial Pain, Vol. 17, No. 3, pg. 191-213, 2003. ↑ Huynh N; Kato T; Rompré PH; Okura K; Saber M; Lanfranchi PA; Montplaisir JY; Lavigne GJ; Sleep bruxism is associated to micro-arousals and an increase in cardiac sympathetic activity. J Sleep Res. Vol. 15, No. 3, pg. 339-46, 2006. ↑ 11.0 11.1 Thie N; Kimos P; Lavigne G; Major P; Sleep structure, bruxism and headache; Headache, Orofacial Pain and Bruxism, Chapt 6, pg 56-61, Churchill Livingston Elsevier, 2009. ↑ Macaluso GM; Guerra P; Di Giovanni G; Boselli M; Parrino L; Terzano MG; Sleep Bruxism is a Disorder Related to Periodic Arousals During Sleep, J Dental Research, Vol. 77, No. 4, pg. 565-573, 1998. ↑ Chikhani L; Dichamp J; Bruxism, temporo-mandibular dyfunction and botulinum toxin, Science Direct, 2003. ↑ Lavigne G; Morrison F; Khoury S et al; Sleep-related pain complaints: morning headaches and tooth grinding, Insom. Vol 7, pg. 4-11, 2006. ↑ Chandwani B; Ceneviz C; Mehta N; Scrivani S; Incidence of bruxism in TMD population, NY State Dent J., Vol. 77, No. 5, pg. 54-7, 2011. ↑ Thorpy M; Sleep Hygiene, http://www.sleepfoundation.org/article/ask-the-expert/sleep-hygiene, 2003. ↑ Capp NJ; Tooth surface loss: Occlusion and splint therapy, British Dental Journal Vol. 186, pg. 217 – 222, 1999. ↑ Amorim CF; Vasconcelos Paes FJ; de Faria Junior NS; de Oliveira LV; Politti F; Electromyographic analysis of masseter and anterior temporalis muscle in sleep bruxers after occlusal splint wearing. J Bodyw Mov Ther., Vol. 16, No. 2 pg. 199-203, 2012. ↑ Conti PC; De Alencar EN; Da Mota Corrêa AS; Lauris JR; Porporatti AL; Costa YM; Behavioural changes and occlusal splints are effective in the management of masticatory myofascial pain: a short-term evaluation. J Oral Rehabil., [Epub ahead of print], 2012.